Joule is the support of luxury iPad, designed to put on display on the Apple tablet on a desk or for use in cooking as a digital cookbook. 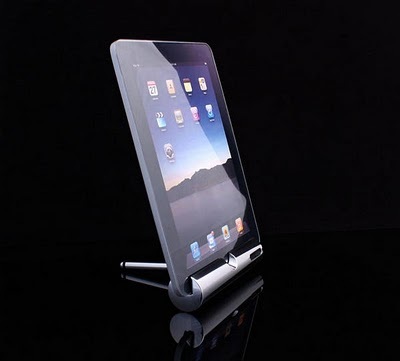 The support consists mainly of a polished aluminum cylinder and a magnetic arm support that can be inserted in one of three holes to adjust the tilt the iPad. Joule is already on sale in the store online Element Homes priced at $ 129, about 100 € plus taxes. This entry was posted on July 15, 2010 at 7:52 am	and is filed under Gadget Technology, Mobile Technology, Notebook Technology. Tagged: Gadget Technology, Mobile Technology, Notebook Technology. You can follow any responses to this entry through the RSS 2.0 feed. You can leave a response, or trackback from your own site.